Hello Fussy and Fancy friends! I live in the land down under, Australia. I have been Stamping for about 5 years and I am addicted. I Looooove Stamps and I am also a Sucker for Dies and Paper too! I usually use Copics but dabble in Distress Markers. 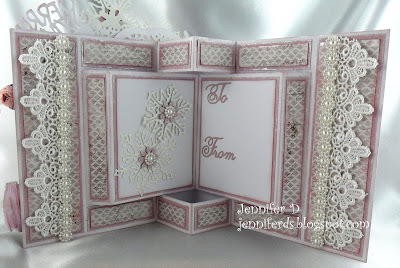 My Favorite Style of Card is an Easel or Book card and I find it hard not to use Lace or Flowers. My favorite Theme has to be Christmas I could make them all year around. are so very beautiful and elegant. gorgeous along with the pop of pretty pink flowers! that you were so generous with! is sure to feel very special indeed. so you can enjoy looking at all of her beautiful creations. Your in for a real treat!